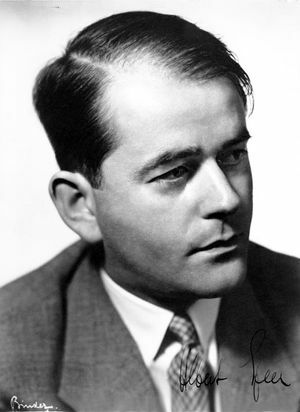 Berthold Konrad Hermann Albert Speer (March 19, 1905 – September 1, 1981), was a German architect and a Nazi Party official. He was part of Adolf Hitler's inner circle in Nazi Germany. Hitler gave him the task of re-designing Munich and Berlin. In early 1942, Speer succeeded Fritz Todt as the German Minister for Armaments. He served in that position until the end of the Second World War. He was able to raise armaments production but used slave labor to do so. He was tried at the Nuremberg War Crimes Tribunal and sentenced to 20 years in Spandau prison, during which time he secretly kept a journal which led to the publishing of two books: his memoirs, Inside the Third Reich (1970)  and later Spandau: The Secret Diaries. (1976) . He died while on a visit to London in 1981. ↑ Hamilton, Charles. Leaders and Personalities of the Third Reich (1984). This page was last modified on 2 January 2018, at 15:01.